yes..........!!! 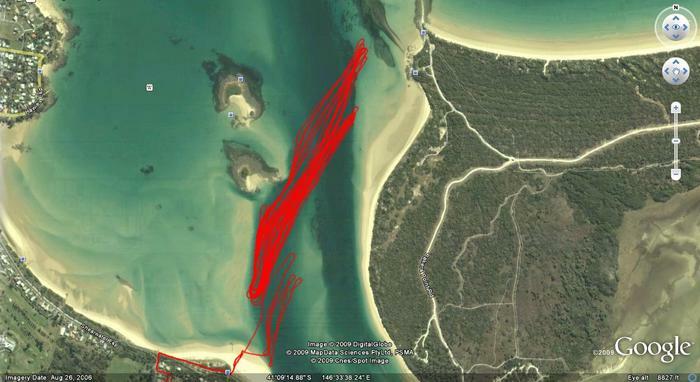 good conditions for an hour on the sand bar quite flat out towards the break water too,i could be still out there going for some kms but with jordans sore ankle and not knowing what the rest of the crew was doing i left it at that.i think i could of had a faster one though. Fanatic Falcon 91,North Warp 6.3,Select SL7 33cm Love This Combo !!! Went for a quick one hour to back up Izaak even though it was a little rough. All was going well then snap the mast broke in half. Spent a couple of hours bobbing aroung in the ocean and finally made it back to dry land. Amazing how quickly you can run out of steam paddling a board dragging a sail attached to a boom with the wind blowing you in one direction and the current taking you in another. Well done on the 1hr PB Izaak. Great effort!!!! Nice Work Izaak-steadily moving up the rankings !!! Hey Firebob its about time you feel how i feel, you stirrer. Well done on the PB 1 hr Jason!! That's great. well done Jason, good to see some one backed me up !!! Yes that to, that's for sure, nice one hours and alphas from the two of you!! What a bummer Stewart, bad luck!! Lucky you did at least make it back in! No worries Izaak, pretty good numbers yourself. Pity you didn't do a few extra K's we could have had a decent distance score as well.